That’s right thrill seekers, sometimes I DON’T drink Earl Grey. I know, it’s a shock. I went through a big phase of drinking Breakfast Teas from T2 a while ago, and I’m still drinking the last of them. Today I’m drinking Adelaide Breakfast. Adelaide is known for its wine and charm, a romantic part of the world where only the best will do. Cranberries, sweet blackberry leaves and lemongrass take you on a surprising taste journey. So… yeh. I guess the cranberries kinda reflect the wine regions? I don’t know. This is definitely a tea on the sweeter side of things. Which is nice for me but I know a lot of people prefer their tea less sweet. The cranberry and blackberry leaves come through with the dry leaves and when it’s steeped. 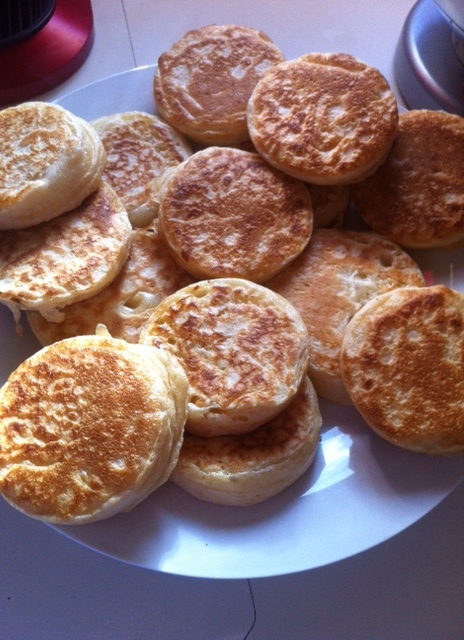 Ever since discovering that it was possible to make crumpets at home, I’ve wanted to do so. And I finally did. This recipe is courtesy of hugo&elsa, who themselves got it from Elizabeth David. And as they suggest, it’s not as hard as it might look – it’s just a wee bit time consuming, especially because of the rising time. Fortunately, I had a solution: make the dough, go for a run, come home and do the second rising – drink tea while waiting – then cook and eat for brunch. Perfect! And as recommended by Hugo&Elsa, it did the latter part in my PJs, because there’s nothing quite so awesome as getting back into them after being outside. 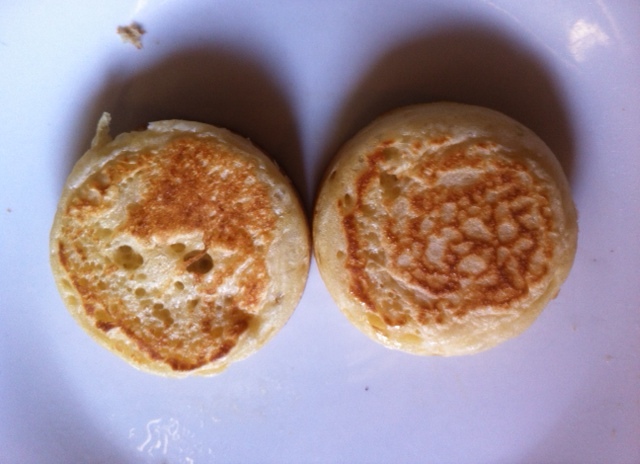 I don’t have crumpet rings – although maybe I need to invest in a set – so I used egg rings, and they worked fine… except when they overflowed a little bit… but that wasn’t much of an issue. I also only had two so for a while I was cooking them through and then starting on the next batch, but then I realised that of course they don’t need to ring after being flipped, so then I had a nice process happening. It was only going to be me eating them, so I only made a half batch – which was still quite a few! I decided not to eat quite all of them, to test the suggestion that they won’t be as good later either grilled or toasted. Because Science. And I know it’s slightly heretical, but I only had a couple with honey… the rest I had with jam from the glorious Kate of Just Add Moonshine. Here you see one with Avalon – an apple and vanilla and pepper concoction; one with LOLA, which is cherry and rhubarb; and one with Cherry Velvet, which is cherry and vanilla and nobody better tell my darling that I ate it without him.